What can I say about 2007? Most of April roasting hot, rain and relatively cool temperatures during May, most of June, July and some of August. Initially this all seemed promising for a very fruitful autumn for fungi but did this actually materialise, in my estimation, I think not. 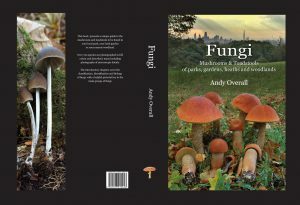 Why, when so much rain hit most of England did we not get such a good fungi season, well I think there are 3 main possibilities for this. Firstly, with so much rain during the summer, certain species such as Russula, Boletus & Amanita began to fruit earlier than in previous years, not in large numbers, just here and there. 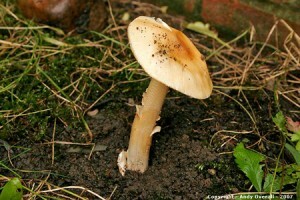 This trend continued from summer onward with September being a dry, cool month, with very little fungi about. In my opinion, the drawn out fruiting period, combined with a cool summer and successful yields from the two previous years all helped contribute toward what I would call a rather lack lustre autumn fruiting in general during 2007. From late August right up until mid November all of the sites that I visit year after year, exhibited a poor showing of mushroom type fungi (Agarics). 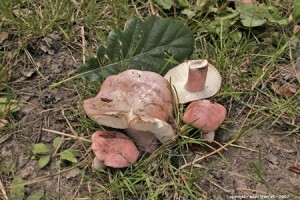 Puttenham Common in Surrey being the one exception, when on August 26th there were excellent showings of Boletus, Russula, Amanita, Cantharellus, Cortinarius and more. During a private visit to the New Forest during September, some local people I had met and chatted with, commented on the amount of fungi they had seen during June, July & August, during and after the rains, this was borne out by decaying rings of Hydnum repandum, Hedgehog Fungus, which I had come across whilst there in September. I normally don’t see this species in the New Forest until at least the end Of October, this seemed very early. However, 2007 was far from being a total right off, it just looked to be more promising than it actually turned out to be, expectations were high and therefore disappointment was inevitable. I had some really good records in 2007 though, mostly from my own neck of the woods, Kenwood-Hampstead Heath. My spring walks took a bit of a hit with the mini drought we had during April. The St Georges Mushrooms began as early as April 1st but soon dried and shrivelled up in the unseasonal heat and reports of Morels on woodchip/mulch just down the road, during a wetter March, only served as a further source of frustration, as I totally missed them. Kenwood was to reveal some real gems during the wet summer months, in areas that I hadn’t previously spent much time looking. Some of these were actually new records for Middlesex, such as Amanita crocea and the very rare Russula zvarae, this being only the 7th record for Great Britain & Northern Ireland and of course the only record for Middlesex. 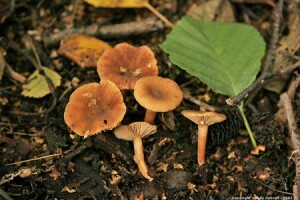 Yet apart from these there were other more frequent species, especially of Russula, R. virescens, R. heterophylla & R, graveolens in various forms, were especially abundant with the Oak on the edge of the stable field. Over in the West Meadow, the boggy North Copse had some interesting inhabitants. Due to the boggy nature of the central area of the copse, Alder has been present there for quite some time, along with a small Birch stand. A few species of note were found fruiting with the Alder & Birch, Lactarius obscuratus was a delightful discovery, one of, if not the smallest of the Milkcaps, it is found in exactly the kind of conditions I describe, in association with Alder. 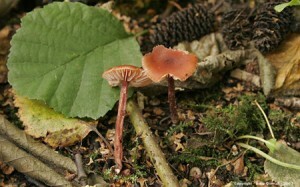 The other nice find was Laccaria purpureobadia, another species that loves these conditions, though it could be growing in association with either Alder or Birch. I must say a big thanks to James (ranger) for bringing these to my attention.